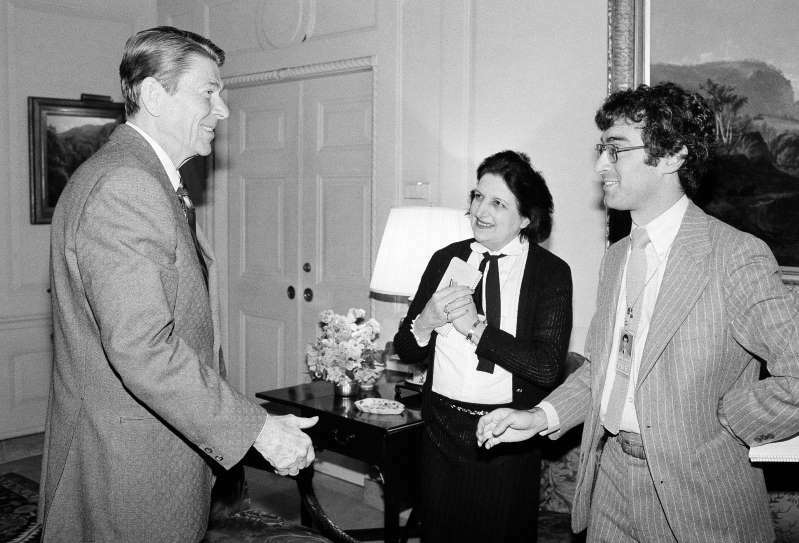 President Ronald Reagan greets UPI reporter Helen Thomas and AP reporter Jim Gerstenzang at the White House on April 13, 1981. Patti Davis is the author, most recently, of the novel “The Earth Breaks in Colors” and the daughter of Ronald and Nancy Reagan. Early in my father’s administration, when he and my mother flew to Rancho del Cielo, the ranch they had bought in the 1970s that was his retreat, his nourishment, I drove up to join them for a day or two. We were sitting at the dining table, and my father pointed to the window and the steep hillside in the distance. I squinted to try to see the reporters he was referring to, but the hill was too far away. Still, I was sure he wasn’t inventing it, and I was impressed by how calm he was. He had once said about the ranch, “If it isn’t heaven, it’s at least in the same Zip code.” His piece of heaven was being unreasonably invaded. [post_ads]A compromise was reached. News organizations would be given opportunities to take photos, but long lenses intruding on his and my mother’s personal space were no longer used. The media may have realized that reaching an agreement was a good idea after my father took matters into his own hands. He walked outside the small ranch house, swayed as if something was terribly wrong with him, then stumbled forward, clutched his chest and fell to the ground as if he were having a heart attack. He stayed down for a few seconds, then got to his feet, faced the hillside and waved at the unseen journalists with a big smile on his face. Obviously, his Secret Service agents had been let in on the prank; otherwise, he would probably have given them heart attacks. The verbal sparring between my father and Sam Donaldson of ABC, or Helen Thomas of UPI, is well documented. But there was never vitriol, there was never name-calling, and if anyone had attacked a journalist, my father would have been the first to stand in the way. I’ve tried to imagine what my father would have done if people attending a political speech of his had turned to the press and raised their middle fingers, hurled obscenities or physically menaced the reporters who were there doing their jobs. I found it difficult to conjure the image, and then I realized why. It simply wouldn’t have happened. The person on the podium, the person everyone has gathered to see, sets the tone. President Trump has quite successfully set today’s tone. He expertly stirred up the anger that was already simmering in the people who support him, and then he lit a match to it. He gave them an enemy — always a useful tactic. And naming the press as the enemy has precedents: Many tyrants have employed it to their advantage. Trump may not read much, but I’ll bet he knows that. Those of us who are horrified by the vilification of the news media, those of us who cringe at the sight of angry mobs jeering at the cordoned-off journalists at Trump rallies, far outnumber those who are swept up by this ugly passion. We are still in the majority. But if we are silent, if we don’t speak up, if we don’t raise our voices and say, “This is not America,” it won’t matter that we are in the majority. Silence didn’t create this country; brazen, unwavering commitment did. And one of those commitments was to a free press — one not controlled or hampered by a demagogue who has a good day only when he’s being flattered.